The UK is set for fierce winds and heavy downpours today before temperatures drop next week, the Met Office has warned. 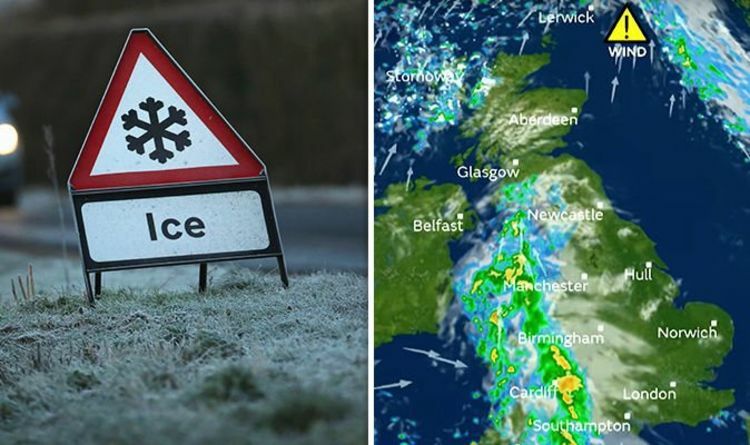 Britons across the country are likely to wake up to snow, ice and freezing rain after Storm Deidre hit the UK on Saturday afternoon. Met Office meteorologist Steven Keates said: “Out towards the south-west, we have got this next band of showers which, as we move through the course of the day, will work its way from west to east. “So, some heavy showery rain potentially across parts of Wales and south-west England. “Some quite gusty winds in association with this too. So, you’ll know about it when it comes through but nothing like the weather that we saw on Saturday. “At the other end of the country the severe gales will slowly ease across Shetland and conditions across northern Scotland will gradually improve. And for many of us, it won’t be too bad an afternoon. The Met Office forecaster said temperatures will pick up slightly on Sunday to around 6C or 7C across the country. But he warned the mild spell won’t last long, with the freezing temperatures set to make a comeback on Monday morning. Mr Keates added: “We will see this band of showery rain slowly march its way a little bit eastwards. “So, some heavy showery rain for the likes of the Midlands, parts of northern England. “And whilst a little bit of snow is possible over the Border hills and North Pennines, it will be nothing like what we saw through the course of Saturday. “Skies clearing later in the day, allowing temperatures to fall away, which means that for Monday morning it will be a cold start. “Again, there will be a risk of some ice around. So, if you have got plans first thing Monday it is certainly worth keeping check of the forecast. BBC Weather forecaster Helen Willetts also warned of severe gales and heavy downpours in Britain next week. The BBC Weather host said Tuesday looks to be a “miserable day” with a huge band of rain set to engulf much of the nation. Ms Willetts said: “There will be severe gale force winds up through the Irish sea affecting much of Scotland. There have so far been numerous reports of collisions because of the onslaught caused by Storm Deirdre. Police in Dumfries tweeted: "Road described as very icy with multiple vehicles crashed. “It appears the freezing rain may have arrived on the motorway."